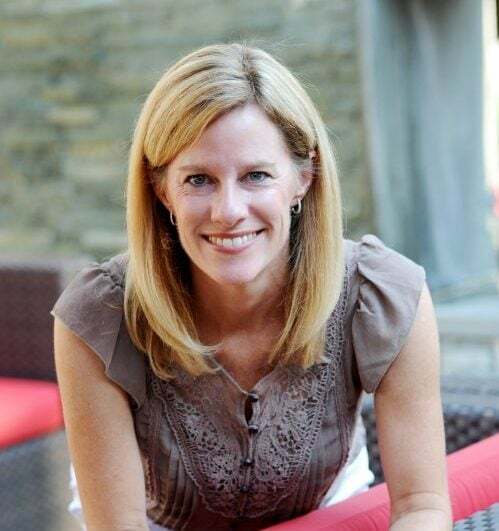 Disclosure: I was asked to participate in the Hodgson Mill #heartbaking18 campaign as a member of the Healthy Aperture Blogger Network. I was compensated for my time. 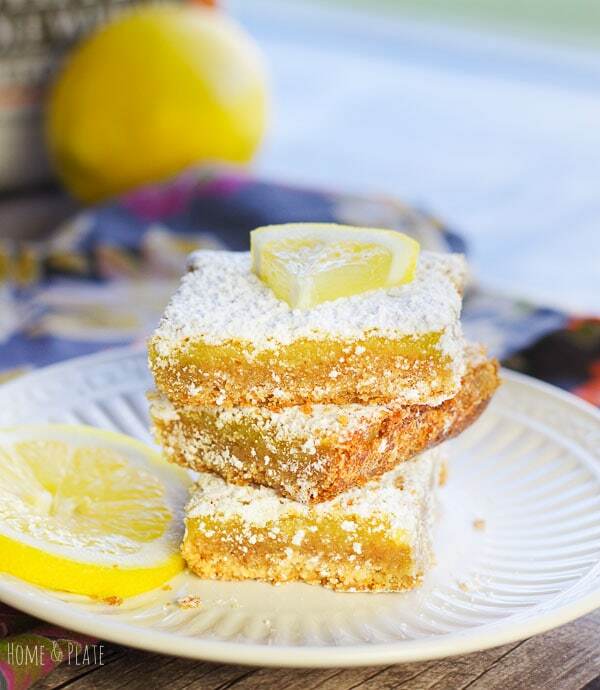 These lemon squares feature an easy, homemade graham cracker-like crust and a sweet and tart lemon filling. They are the ideal dessert for your spring and Easter parties. 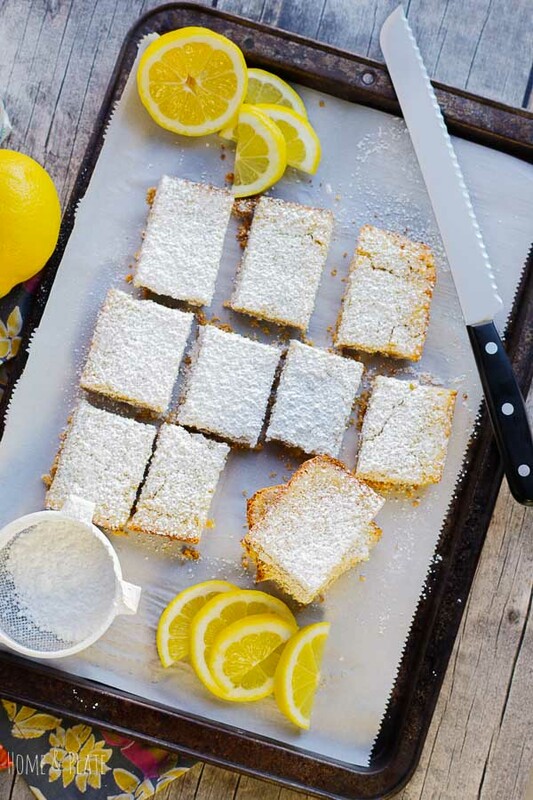 These squares are so easy to make and perfect for all you lemon lovers. They are melt-in-your-mouth delicious. I promise you just can’t resist the lemony filling. For this recipe I decided to create a unique crust using Hodgson Mill whole wheat flours. The crust has a graham cracker taste thanks to graham flour. One bite and your taste testers will think you made the crust using graham crackers. Any way I can add a little wholesome goodness to my baking I do. Substituting whole wheat graham or white whole wheat flour for all-purpose flour is an easy way to add nutrition when you bake. Plus whole grains are a key source of fiber. I’ve been trying to increase the amount of fiber my family eats. Most people don’t get enough in their diets, which is vital for heart and digestive health. I started slowly by substituting 1/4 to 1/3 the total flour in my recipes with whole grain. My kids didn’t even notice, but they are getting the whole grain benefits. That is a win-win! While the crust showcases the whole grains, it’s the filling that is the star of this dessert – zesty and lemony sweetness! This recipe comes together easily in under an hour. Follow these handy steps for a delicious tasting dessert. 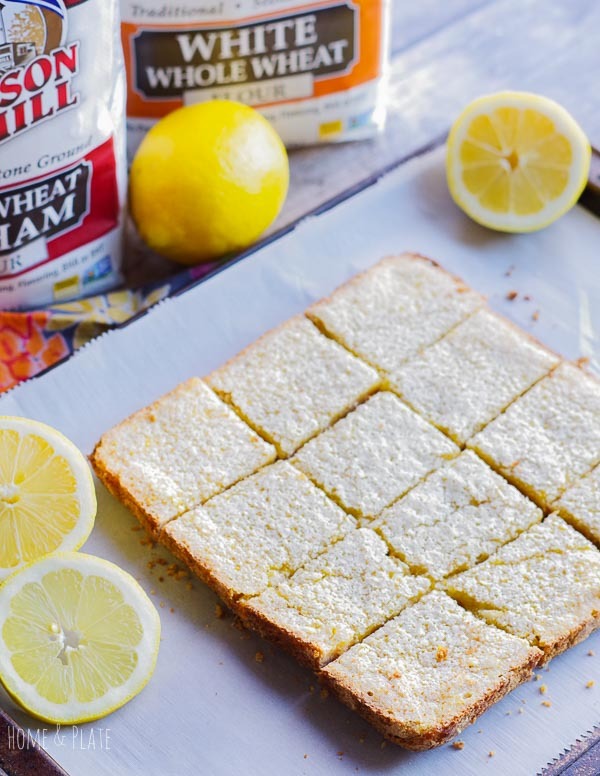 Use parchment paper in your baking dish to make removing the lemon squares from the pan easy. Pour the lemon filling onto a warm crust to prevent a soggy crust later. Refrigerate the baked lemon squares to make cutting easy. Use a pizza cutter or serrated knife to slice the perfect sized bars. One lemon should yield enough juice and zest for this recipe. Do not omit the baking powder or salt. It helps pump up the volume of the filling. Need more graham crusted lemon squares? Simply double the recipe and use a 13 x 9 baking pan. This time of year, I love the fresh citrus at the market. 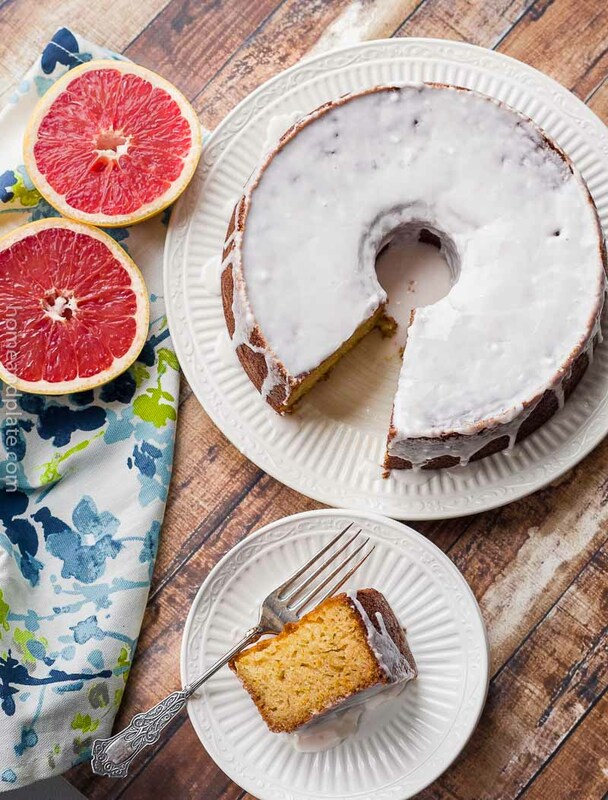 Lemons, oranges and especially grapefruit are ripe for picking and this recipe would be delicious using any king of citrus. Just be sure to use fresh and not the stuff in the bottle. Fresh tastes best! 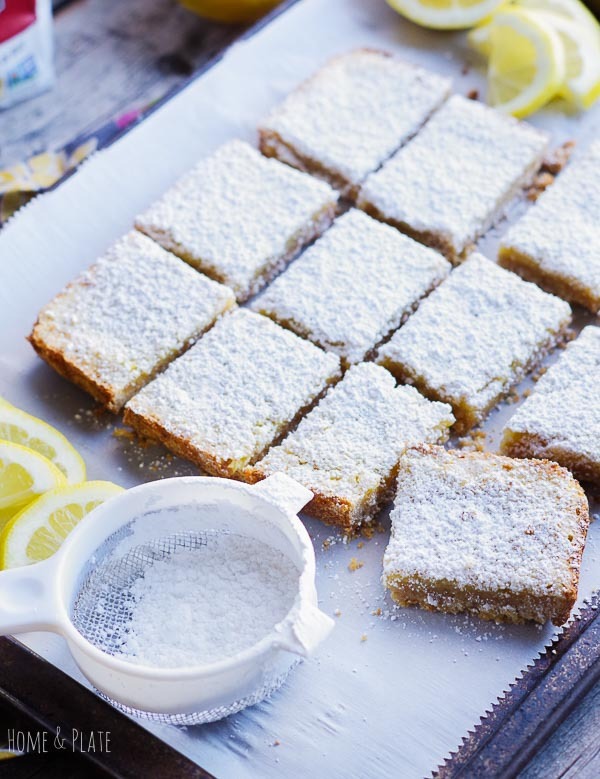 These lemon squares are all about the slightly nutty crust. These tips will result in the most delicious lemon squares. 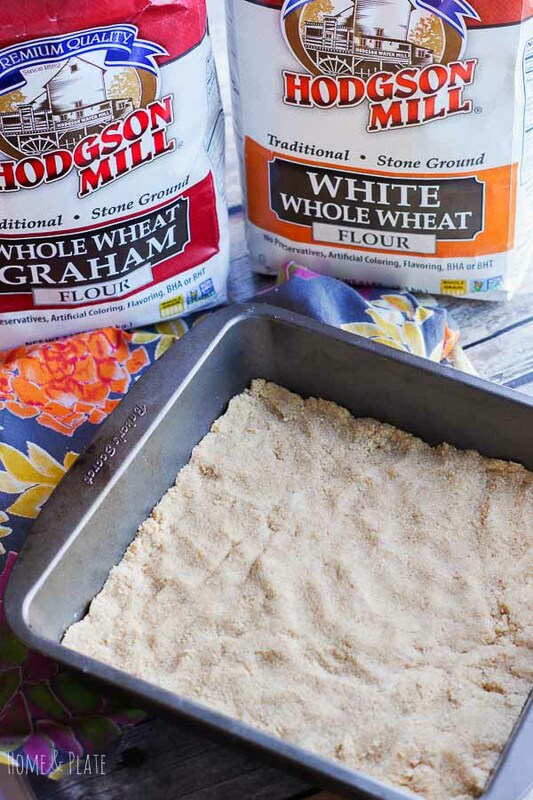 Use a mixture of graham whole wheat flour and white whole wheat flour for a graham cracker-like crust. Use a mixer instead of mixing by hand for a more delicate crumb. Be sure to use powdered sugar to make the crust light and crumbly. You’ll need it anyway to sprinkle on top once baked. Do not use melted butter. Softened butter makes for a tastier crust. 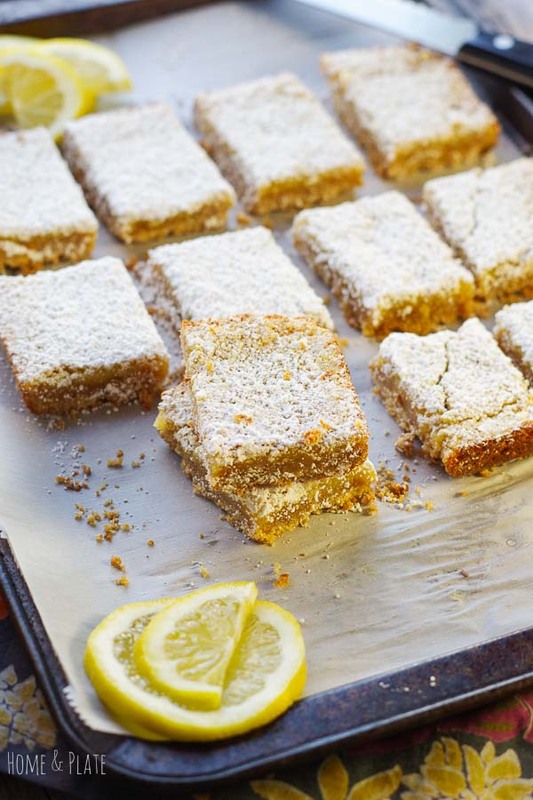 Want to try these Graham Crusted Lemon Squares? 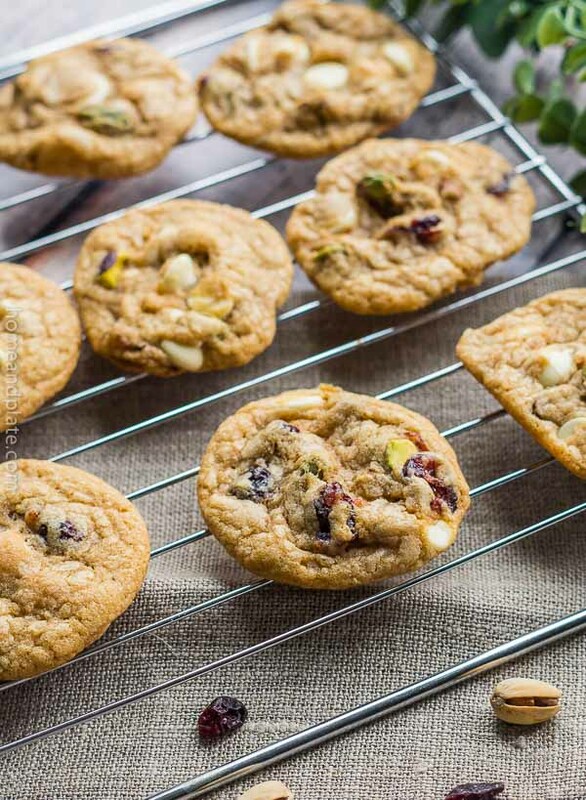 Pin them to your Dessert or Spring board to save for later! 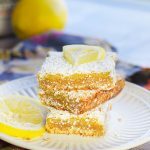 These lemon squares feature an easy homemade graham cracker-like crust and a sweet and tart lemon filling. Preheat the oven to 350°F. Cream the butter and powdered sugar. Add in both flours and mix well until slightly tacky. Press the crust mixture into a 9-inch square baking dish using your fingers to spread into the corners smoothly. Bake the crust until light golden brown, about 20 minutes. Meanwhile, prepare the filling. Beat the eggs, sugar, lemon juice and zest in a large bowl. 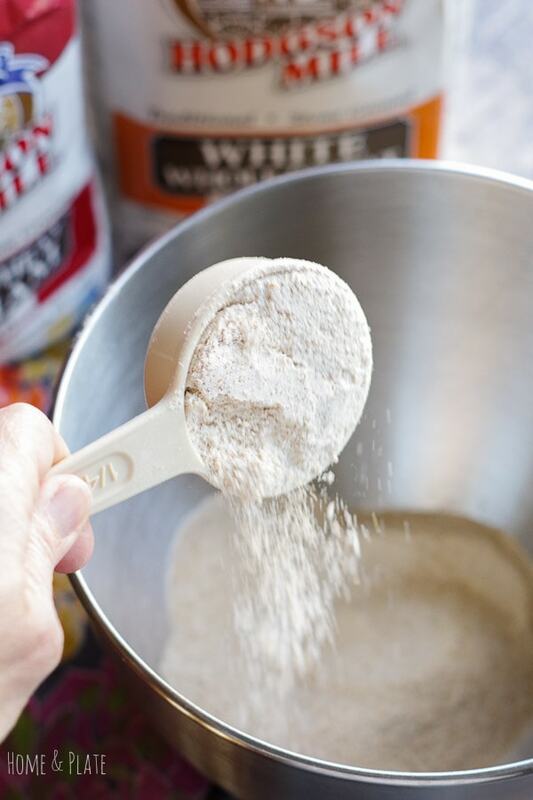 Whisk in the flour, baking powder and salt. Once the crust has finished baking, pour the filling on top of the warm crust. Return the pan to the oven and bake another 20 minutes until the edges have browned slightly. Cool completely then refrigerate the pan for 1 to 2 hours before cutting. 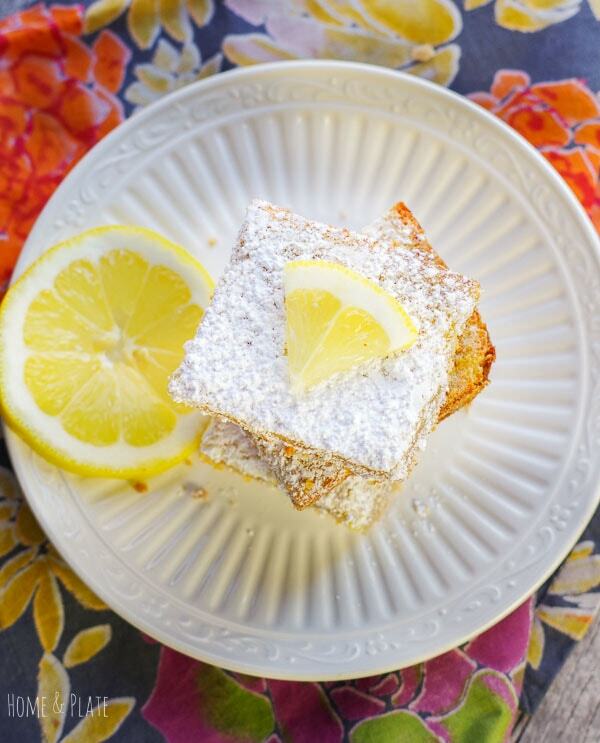 Remove the lemon squares from the pan and sprinkle generously with powdered sugar from a fine mesh strainer. These look incredible! 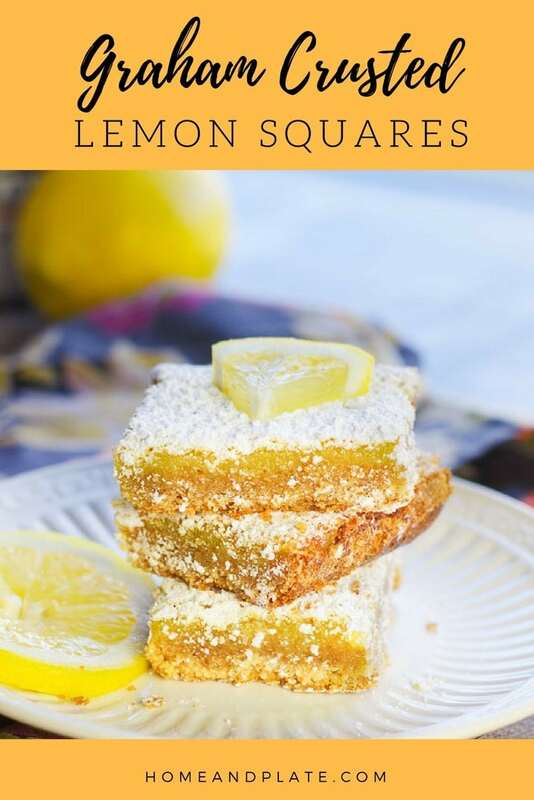 Lemon desserts are my weakness, so I know I would have to have 2 of these squares! These look so delicious! I’ve never seen whole wheat graham flour. I’ll have to keep an eye out for it. You can find graham flour in the organic or the flour aisle. It’s also available on Amazon 🙂 Thanks so much. One of my personal favorites! I love the idea of mixed flours for the crust. Yum! Lemon squares are one of my favorite desserts too. Thanks so much. Any kind of lemon dessert is good with me, and it makes me think of sunny spring days. I can’t wait to try these.